The early people of Rome were from a tribe called Latins. They were from the Plains of Latium. The Latins were successful farmers and traders and they became rich and successful. Therefore, Rome from its early days was a rich city. No one knows how or when Rome was founded. One legend says that the Trojan warrior Aeneas set up a kingdom in Italy after the fall of Troy in 1100 BC. 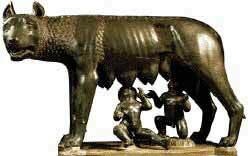 Another legend tell us that the city of Rome was founded by Romulus in 753 BC, and that early on he murdered his brother Remus for ridiculing his pomerium, or the sacred boundary of the city he had founded. This city was named Rome after its legendary founder, and we have a suitably heroic beginning for a city that would one day rule the entire Western world. Writers of later eras, including many Romans, would infer quite a bit from the part of the story where Romulus murders his brother, and say that as Rome was founded in an act of bloodshed, so the shedding of blood would become part of the Roman legacy. During the 500's BC, the Etruscans ruled Rome. The Romans rose against the harsh Etruscan King Tarquinius Superbus, and declared Rome a Republic in 509 BC. The Roman Senate, which had originated as an advisory body to the monarch, decreed that Rome should have no more kings. The Roman republic, founded, according to tradition, in 509 BC, had an aristocratic form of government. It was headed by the Senate and by magistrates, later called Consuls-usually two in number-who were elected annually by the Senate. Lucius Junius Brutus - The legendary founder of the Roman Republic. By 31, Octavian had defeated Antony and had successfully established himself as princeps, or first citizen. The Senate conferred numerous honors upon him, among them the military command (imperium), hence the modern term emperor. The republic was dead. Octavian established a system of government called the principate that endured for two centuries. The principate, "rule by the first citizen", was a monarchy disguised as a republic. The princeps (the emperor) ostensibly ruled by commission from the Senate and the people. There was no automatic system of succession. Normally an emperor succeeded to the throne by virtue of connection--by blood, adoption, or affinity-with a predecessor, or one could seize power by force and inaugurate a new dynasty. Larth the Etruscan - Follow Larth the Etruscan on a fascinating journey through the history and places of his homeland.